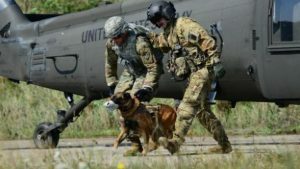 A new program has just started called Multi-Purpose Canine (MPC) Tactical Equipment created by the U.S. Army Special Operations Command. 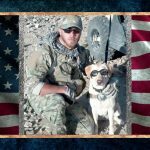 This program equips the dogs of the 75th Ranger Regiment’s with new, highly advanced tactical vest protection, wearable sensors and video cameras. These dogs operate in many highly complicated conditions so they always need the best equipment to keep them safe and to better protect the soldiers. Tactical Waterproof Vest: Each dog will get a highly advanced vest that weights no more than 1.5 to 3 lbs. The vest will be able to carry equipment like lights, communication systems, sensors, and cameras along with having insertions with rappelling straps. Camera System: The camera system mounted on the dog could provide surveillance and vital reconnaissance to help give the Rangers advance warnings on any human threats hiding around the corner or IED’s in the path. The camera system will be lightweight, no more than 2 pounds, transmit clear video in low light and will also be waterproof. Sensor System: This new sensor system will include high power strobes, infrared light and a green light. It will also respond to voice commands to activate lights and weigh around 8 ounces. Because the vest is waterproof, the dog will be able to jump into water and leave markers for its team to follow. Let us know what you think in the comments below—and we’ll send you FREE SGPT STICKERS! WANT AN AWESOME WAY TO LEARN WHAT YOUR CAPABILITIES ARE? 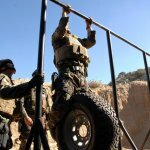 Packed with tons of info and a custom workout program developed by SGPT Coach Tom Coffey, 2nd Ranger Battalion. And, when you purchase, you get SGPT’s popular 90-Day Strength and Conditioning program—FREE! Six months of training! Whether you’re female or male, civilian or military, this awesome program will get you into killer shape, mentally and physically. CLICK ON THE BANNER ABOVE TO GET STARTED! QUESTION: Coach, I’m doing alright with my arm strength for my pullups but my hands get really tired. Do you have any ways I could make them stronger? ANSWER: While having good upper body strength is needed for pull-ups, your hand strength is almost more important because you can only go as long as they’ll let you. 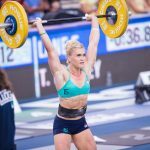 We’ve put together an article full of great tips about how you can improve your grip strength. Try this article, too—Grip Strength Training for American Ninja Warrior. QUESTION: Hello to all at SGPT. I’ve been going to the gym regularly for years but I feel like I’ve hit a plateau and I can’t get past it. In researching new ways to work out, I found your site and your 6-month program is very appealing. My question is can it be done by females or are your workouts just for males wanting to go into the military? ANSWER: We have lots of females following our daily workouts and we do have a few in the 6 month training program as well. If you can’t do one of the routines, scale it or hit me up with a question about alternatives so you can get to the level you want to train at. Need a supplement to make sure your nutritional foundation is solid? Get Athletic Greens. One scoop delivers a powerful punch of essential amino acids, vitamins, minerals and 11 important superfoods, adding an awesome boost to your nutrition.